Need a simple, inexpensive way to make straight sided round and square holes in concrete slabs and walls? Stop wasting money on Styrofoam and pick up some Kwik Klik and Kwik Wedge hole formers today! They're rugged, inexpensive and simple to operate. Unlike our competitor's hole formers, which are either short-lived or too expensive, ours require NO extra tools!!. Custom sizes normally ship within a week! Low Cost Kwik Klik riser forms strip completely and cleanly. One flip of the core handle, one flip of the jacket handle, and just lift the finished part out. • Less than half the cost of standard collapsing core forms. • Built solidly. Most forms we made in 2001 are still used every day. 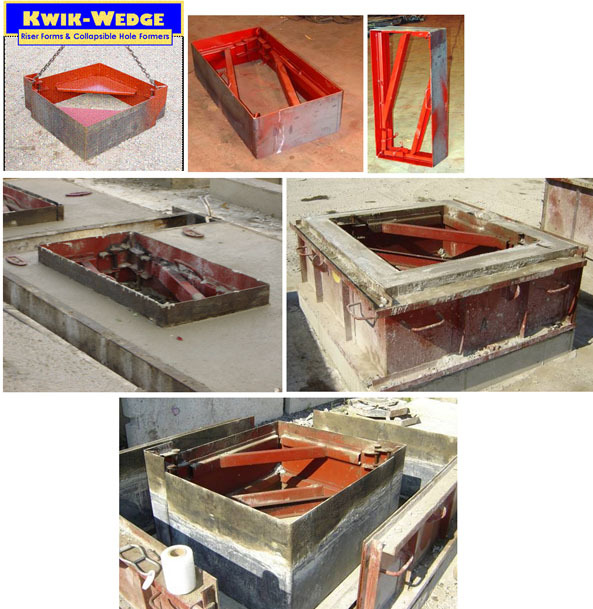 Low Cost Kwik Wedge Catch Basin Forms Can be poured in 2 stages either upright or monolithically upside down. • Simply lift the core by the corners and it strips automatically. • Two piece L-shaped jacket halves can be made solid or hinged so knockouts don't have to be removed in order to strip the form. • Straight, not tapered inside walls. • The will last for decades. Some already have. Dynasty Metal Works, Inc. Makes the very finest Precast Forms you can buy. 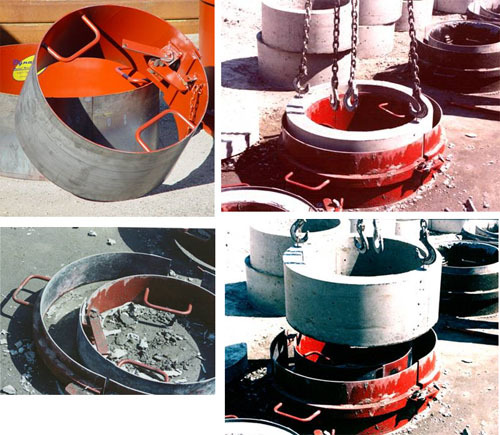 Whether it is just a simple manhole form or a special shape that noone else is interested in, give us a call.